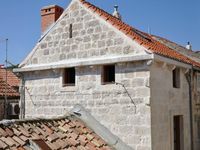 Property 5: Adorable stone house with terrace,20m distant from beach ! This is a holiday house designed for nature lovers and full relaxation. Property 30: This is a holiday house designed for nature lovers and full relaxation. We appreciated getting in early, were thankful that our host arranged a taxi for pick up at the ferry terminal, loved having milk, beer and pop in the fridge and really loved the spotlessly clean home. The furniture, both inside and outside was in good condition and very comfortable. The beds were comfy and the individual room air conditioning was a bonus. Like other locations throughout Croatia, feral cats are a nuisance. Upon our arrival, 6 cats immediately converged, but did leave with several rounds of encouragement. Our only suggestions for improvement are to provide a toaster, oven gloves, pool towels, and sufficient toilet paper. Pickly yes, but 3 rolls for 6 people for 3 days is not enough. It was the only time we had to buy toilet paper and we stayed in 8 different places throughout our visit. The description noted a microwave, but there wasn&rsquo;t, one. This didn&rsquo;t matter to us, but may to some. Overall, we loved it and would highly recommend it.